This spectacular 20 plan has been beautifully updated and finished throughout with mid-century modern décor. The owner took great care in choosing comfortable, quality furnishings for her guests. This wonderful two bedroom, two bath vacation home is perfect for short vacations or an extended winter escape. 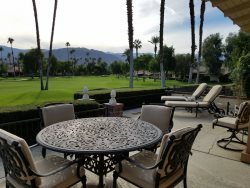 Guests will love the large wall-mounted cable TV with DVD player in the great room, but the main focus will be on the panoramic view through the wall to wall windows overlooking the extended back patio and the south 7th fairway beyond. The dining area seats six and the well supplied kitchen features stainless appliances and everything you will need to prepare casual meals or elaborate dinners. This vacation home has perfect separation … which is the beauty of the 20 plan. The master and the guest bedrooms are on opposite ends of the condo providing ideal privacy. The master bedroom has a comfortable king bed with wonderful bedding, ceiling fan, a large flat-screen TV and a private on-suite with walk-in shower. Sliding glass doors lead out to the back patio. The guest bedroom has a beautiful new queen bed, ceiling fan and a cozy reading chair. Sliding glass doors walk out to the private front courtyard and the guest bath, located just outside the bedroom, has a shower/tub combination. Guests can easily walk to The River just outside the front gate of Rancho Las Palmas. Walk to shopping, dinner or a movie. Or enjoy a spa day at the Rancho Las Palmas Resort and Spa ... also just a short walk from your door. This property is professionally managed and the managers were great to deal with and provided very clear instructions. Everything was comfortable, and the location was convenient. Excellent place for weekend getaway. 5 Stars! We came to get away from the city and for relaxation, this place was perfect for that. We will definitely be back when we wanna get away.